View the entire table of contents for the Sept. 15, 2000 issue. September 15th, 2000 Secrets of Wine Collecting The hunt for fine wine can lead you from the auction house to your neighborhood retailer to the far reaches of cyberspace The "wine snob" is a familiar caricature: pompous, pretentious and boring. 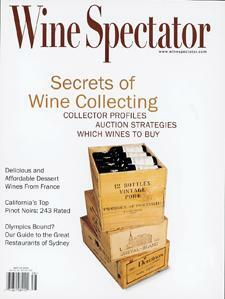 For the full article, check out the new issue of Wine Spectator, on newsstands September 15, 2000.